Whether you order custom t-shirts on a regular basis or you are looking to place an order for the first time, this post will help you decide which shirt option is best for you. Here I’ll break down the various aspects to help you decide. Think about what you are ordering custom t-shirts for. A family reunion? A team sport? A business? Are you creating your own t-shirt brand? These are important questions to answer to figure in choosing the right custom t-shirt. If these are for a sport you want to stay away from 100% cotton. Look instead at the blend and poly options because anything will poly will offer some moisture wicking help. Moisture wicking is when the fabric allows sweat to escape the fabric of the shirt. This means the shirt stays more dry than a cotton shirt that tends to soak up sweat. If you are ordering shirts for a family reunion or business, generally there are budget stipulations. In these cases price out cotton shirts first as they are the least expensive. If you are starting your own t-shirt brand talk to us about the advantage of spending more on a nicer shirt. Something that fits well and feels soft can always resale at a higher price. It’s not neccessarily better quality than cotton because the manufacturers generally make all styles. But with today’s trends the soft feel equates to quality. Nobody ever orders custom t-shirts without a budget. Either they have an idea of what it costs or they have a budget they need to keep the shirts inside. More often than not in both cases the perception is unrealistic. For every customer that thinks a price is too high, there is a opposite customer who is thrilled at the price. Best practices when ordering custom t-shirts for the first time is to have a range you’d like to stay in. There are many variables we have to consider when pricing custom t-shirts. We will always give you options to stay within your budget. The order from least expensive to more expensive is cotton, poly, triblend. There are some blends priced like cotton and poly performance shirts have a big range. Triblends are the softest shirts but also have a higher price point. In choosing the right custom t-shirt sometimes you won’t have an option. If you are dead set on a particular color non standard color like lime green or mint. Then your options are going to smaller and the color will determine what shirt works best. All the standard colors will just about come in every style. While cotton styles offer far more colors than blends they tend to be the most popular option. In reality, 100% cotton t-shirts still make up 80% of the orders we print. The other 20% is made of dryblends, triblends, and poly shirts. Triblends being the smallest style we print. Cotton t-shirts are the tried and true shirt that has been around forever. They offer the most colors at the best price. 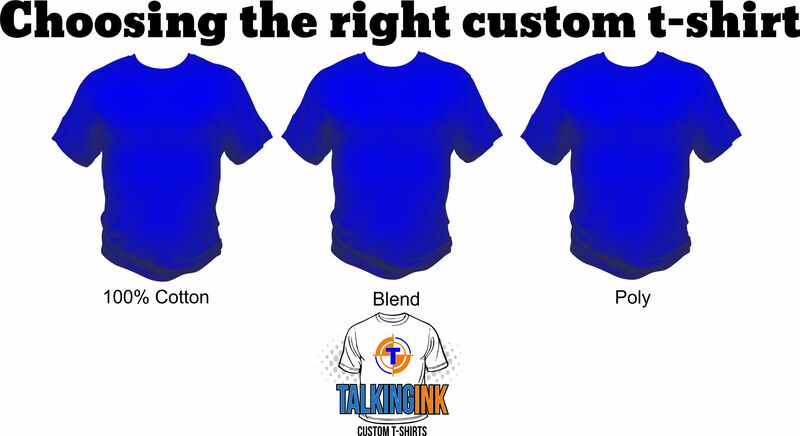 Here at Talkingink, we’ll be happy to discuss your order, provide you with options and screen print you the highest quality order at a price you’ll like. Feel free to contact us by phone, email, or design online.